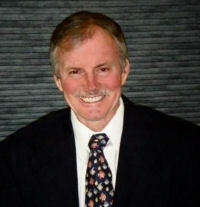 I found out today, from Professional Debriefer Paul, that one of our regular diving icons, Dennis Gunn – known on this website as “Dennis G” or “Dr. D” died yesterday. Dennis was one of the original divers that I met when I started diving more than a decade ago; he made the dives and debriefs interesting, fun and enjoyable. Over the years, Dennis became a regular in the local Sunday morning and Wednesday evening diving groups and, even though he never was given a unique diving nickname, quickly developed a unique reputation. Nobody who had ever dove with Dennis expected to end the dive with Dennis; but everyone made it back alive and well. 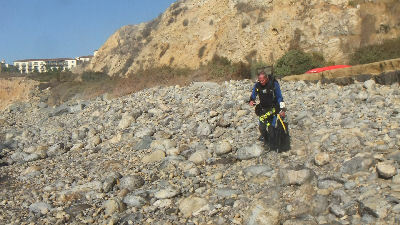 Well, there was an incident that did involve a rescue by the Coast Guard, but he was solo diving at that point. He often shared that story so that other divers would not make the same mistake. People learned to cut his visibility reports in half. He brought many people to our group of divers and Dennis was one of the reasons that they stayed. Listening to Dennis talk about his high finance entrepreneurial ventures, his diving adventures – or misadventures – and the latest injuries he received while playing ice hockey were priceless. He had a good judge of character and often gave me advice on new comers to the group. And that I did; his advice could have kept me out of jail. 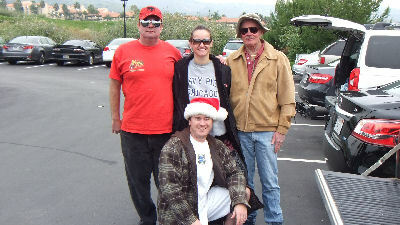 January 1, 2012 New Year’s Dive and Debrief – Happy New Year Everyone! Dennis on the rocky shore of Terranea Resort. 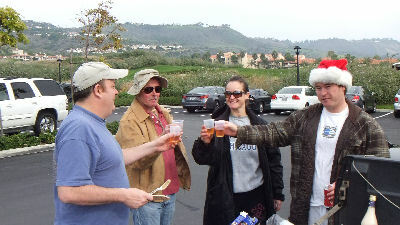 In all the times Dennis attended our famous beer and barbecue fueled post-dive debriefs, he almost never drank beer. The one or two times he did drink a beer, were special occasions – I believe he had up to 13 beers. And when I say 13 beers, I’m talking about in his entire life; he kept count, and we were all waiting for the next occasion when he could have number 14. Another era in local diving has come to an end. The day I met Merry was a typical Dennis Gunn dive adventure. The regulars were debriefing early at Marineland after calling the dive. Waves were crashing into the shore and anyone who had ever diver there knew that meant injuries, lost gear or at least major embarrassment from a lousy exit. Dennis never saw conditions he wouldn’t dive in. He took Merry, a new diver making one of her first dives at Marineland and Christine Lyman, another female diver and promised to take good care of them. They made it through the surf alive and headed for the 120 reef. 45 minutes later we saw the two ladies pop up far offshore with no sign of Dennis. They made the long surface swim toward shore, Christine heading for the cave and Merry choosing the lesser of two evils by going straight for the beach. Merry got tumbled hard and had to be rescued by several divers in street clothes. Christine was frozen just behind the surf. Ron Dog told her to remove her weightbelt and she ditched it in the surf rather than handing it off. I had loaned her weights before their dive. Dennis exited several minutes later and said nothing about ditching the girls. That was Merry’s first and last dive with Dennis. He had a guardian angel with him on most dives. I think the only time he got hurt was a Honeymoon Cove dive when he lost both fins and hurt his ankles. Every other dive he was invincible against rough conditions. That’s a great write-up PSD! 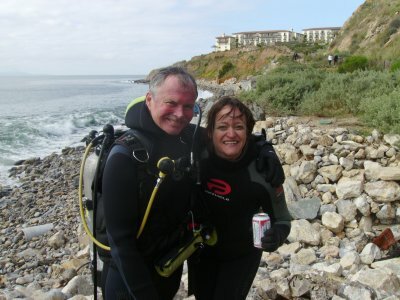 I met Dennis at Malaga Cove after a cancelled Reef-Check dive and he suggested trying either Honeymoon Cove or OML. 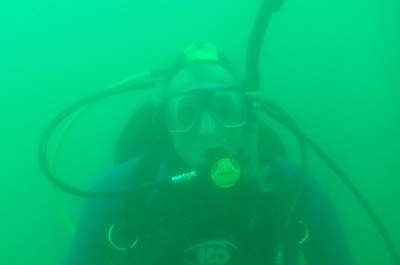 I was a new diver and new to the area and didn’t know anyone (or know any better lol) so I was easy bait to become Dennis’ Dive buddy that day! So he ended up giving me my first tour of OML (no not Honeymoon… he can have good judgement occasionally!). Unfortunately I didn’t see anything but the tip of his fins as my only focus became trying not to lose him. But I actually managed to surface with him at the end of the dive and go on to dive with him again… and also lose him a number of times once I realized that is to be expected when you dive with Dennis. He was always so nice and helpful to me and I owe him for introducing me to the SoCal diving community. By the sounds of it, has has inspired many other divers in the same way (aside from maybe Merry and Christine and the woman he took diving when he had to be rescued by the Coast Guard lol). I just hope he realized that, as I never got a chance to tell him. When asked if I’ve ever dived with Dennis my standard answer is, “Well, I’ve started a lot of dives with him”. Farewell Deni, you old poacher. I enjoyed diving with Dennis quite a few times. The last time I dove with him was on thanksgiving day at Redondo. We walked down to topaz jetty and he was going to show me the pilings. We never found them. but it was a great day. It’s so classic to hear people say Dr. D had 500 first open water dives. He was a unique character. Even in the bottom picture…his shirt is on backwards. What a guy. I’m glad I got to meet him and dive in the same ocean at the same time as him. Debriefs will not be the same. I was lucky enough to meet Dennis through the Divevets group and Rev. Al’s crew back in 2013. 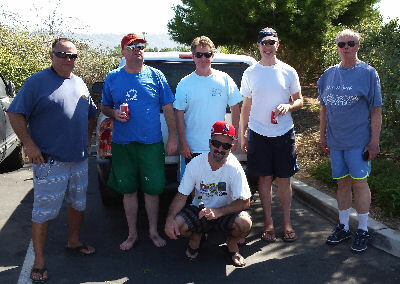 We became fast friends, and would frequently dive together early mornings in RPV and Redondo. At the time I was 26, and I remember being in awe of how fit this salty old sea dog was. It seemed like the man never ran out of energy. I also remember him as one of the few divers I could always rely on to show up, no matter how early. Before I connected with him, I was doing a fair amount of solo local diving. For all the joking about Dennis abandoning buddies on dives, I’m not sure I ever saw that myself. He was a no nonsense type, who wasn’t there to hold anyone’s hand. Somehow I managed to keep up with him though, and can’t recall a dive where we split.